Many of us hit that stage in life where we – and our friends – start to drift away from team sports, but are still in need of that competitive aspect of our lives. Some take to running, or triathlons, some decide to pick up a set of clubs and find themselves on a golf course. Now, the other 3 members of my infrequent 4 Ball will happily testify that I rank up there with the very worst golfers you will ever see. Thats not to say I dont enjoy an occasional round, but my grip is what one friend described as an ‘afront to the game’. High praise indeed. The standard right handed golf grip is left hand over right but, for whatever reason, I play right hand over left – essentially a left handed grip for a right handed swing. It sounds ugly (it is), but eat my 2 pars on the Ryder Cup Course! I digress. As the above has made clear, I am far from a golf expert, so I will not spend too much time discussing the finer intracacies of where your middle finger is gripping the club, or whether you should be able to see 2 or 3 knuckles, I am merely going to break down what happens when people start feeling symptoms of what is commonly known as Golfers Elbow (GE). Medial Epicondylitis, to give GE its proper terminology, could be considered the little brother of Tennis Elbow (lateral epicondylitis), and is much more rare that Tennis Elbow. Much like Tennis Elbow, it is not unique to golfers and is a common complaint amongst plumbers, carpenters, desk workers…..even drummers! So how do we differentiate? As is often the case with anatomy, the answer is in the name. So essentially, inflammation of the inside edge of the elbow. GE is at its root, an over use injury. Many muscles attach through tendons to the Epicondyle, and due to the hugely repetitive nature of swinging a golf club, these muscles pull and strain which can lead to inflammation and/or damage to the tendons, causing huge pain in the inner elbow area. The damage to the tendons is classified as Tendinitis (inflammation of the tendon), or Tendinosis (degrading of the tendon), and a qualified therapist will be able to differentiate. Symptoms? Pain! 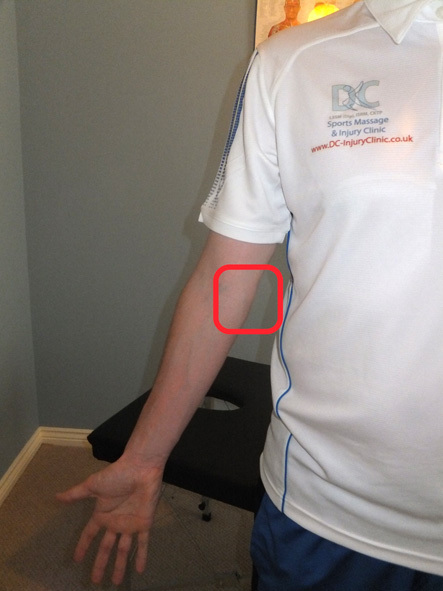 The inner edge of the elbow area will be painful, and the pain may increase on movement. Movement of the wrist – for example gripping – may exacerbate the pain. There may be some visible swelling, and in some cases loss of strength in the affected arm and wrist. The inflammation of the muscles and tendons can also compress the ulnar nerve leading to numbness further down the hand and toward the fingers, similar to symptoms of carpal tunnel. The first thing to do with any acute injury is the P.O.L.I.C.E procedure, to enable some level of pain management. A simple stretch to try at home is to turn your palm away from your body, and lay the palm down onto a flat surface (see picture). We also need to look at exactly which of the soft tissues in the forearm are the guilty suspects; to loosen any excessively tight areas, and ease the load of overworked muscles which may mean (short-term) amendment of offending activity. There may also be a need to correct any potential biomechanical issue creating a problem, which will often include a graded and relevant strengthening programme. This entry was posted in Uncategorized on 21st June 2012 by DCInjuryClinic.